After careful examination, it was determined that the patient had roughly 37% total body surface area involvement, leading to a diagnosis of TEN. The patient was stabilized and fluid resuscitated appropriately. Transfer was arranged to a dedicated burn ICU for careful supportive care and frequent extensive wound dressing changes. 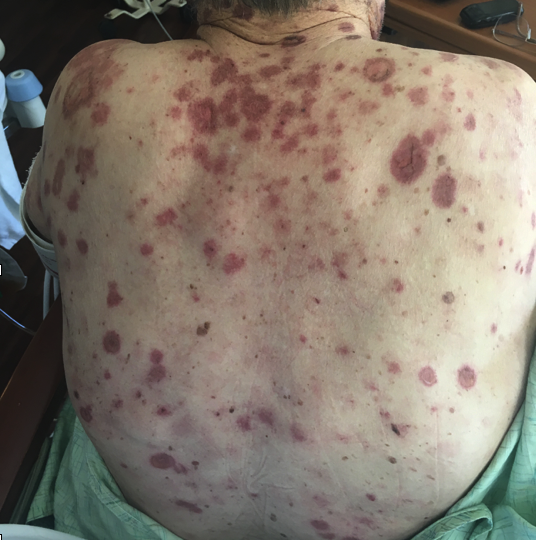 It is now recognized that Stevens Johnson Syndrome (SJS) and Toxic Epidermal Necrolysis (TEN) are both part of the same disease spectrum, differentiated based on the amount of body surface area that is involved. The likely pathophysiology is a CD8+ mediated type 4 hypersensitivity reaction that leads to keratinocyte apoptosis, subsequent necrolysis, and widespread epidermal detachment. In more simplistic terms, an inciting antigen triggers an autoimmune attack, leading to blistering, and separation of large sheets of epidermis from the underlying dermis. Medications are the most common inciting antigens. Other etiologies include infectious (more common in children), malignancy, and idiopathic. The most common medication offenders are the “anti” drugs: antibiotics (often sulfa drugs), anti-epileptics (especially phenytoin, valproic acid, lamotrigine, carbamazepine, barbituates), anti-retrovirals, and anti-inflammatories (NSAIDs). Other notable inciting drugs include allopurinol, aspirin, and analgesics. The most common inciting infections are viruses (notably HSV, EBV), although bacteria (mycoplasma pneumonia) and fungal infections have also been commonly implicated. It is likely that certain people are predisposed to develop this dangerous reaction. There is some data on genetic predisposition (something about HLA haplotypes) that is beyond the scope of this review. However, notable risk factors also include HIV and malignancy (especially lymphoma). Patients occasionally get a prodrome of “flu-like” symptoms (headache, fever, rhinitis, malaise, etc.) for 1-14 days prior to rash. The rash tends to begin on the trunk or face, but often involves the palms and soles as well. Mucosal involvement is described in at least 90% of cases (and some sources make this a diagnostic criteria). Most commonly this involves the buccal, ocular, or genital mucosa, but can also involve the respiratory or GI tracts. The rash itself is dark and dusky, often displaying the classical target morphology, along with extensive blistering. Nikolsky’s sign will be positive (mechanical pressure will lead to blister formation). The differential for this type of rash also includes autoimmune blistering diseases (such as pemphagoid, phemphagus) and staphylococcal scalded skin syndrome. Physical exam is focused on identifying and describing the rash, estimating the total body surface involvement (assists with classification between SJS and TEN and tailors fluid resuscitation), and carefully documenting mucosal involvement. Only areas that are blistering, necrotic, or Nikolsky positive should be included in this calculation (do not count simple erythema). Similar to burn criteria, use the rule of nines or use the patient’s palm (which represents 1% TBSA). The SCORTEN parameter, is a severity score that is sometimes used to predict mortality, and includes factors such as age, tachycardia, history of malignancy, initial surface area detachment, high serum urea, glucose, and serum bicarbonate. Dermatology consultants will likely perform a skin biopsy to confirm the diagnosis. Biopsy results would be expected to show sub-epidermal bullae and full thickness necrosis of the epidermis as well as perivascular lymphocytic infiltration. The mainstay of treatment is removal of the offending agent. 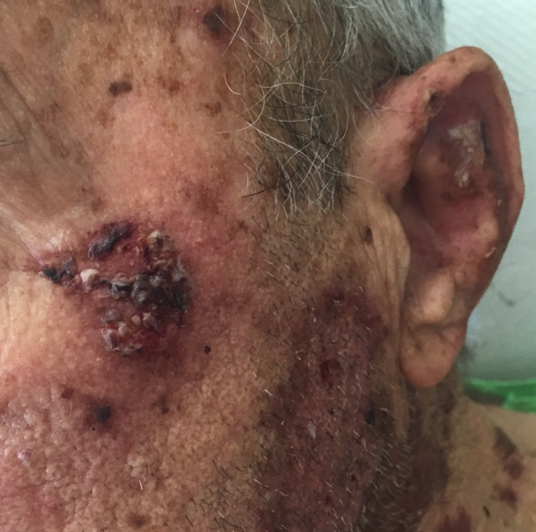 If it is unclear which medication is the offending agent, it is recommended to stop every drug that isn’t crucial to life as this is a true dermatologic emergency with a mortality rate of up to 30%. Additional treatment is largely supportive. 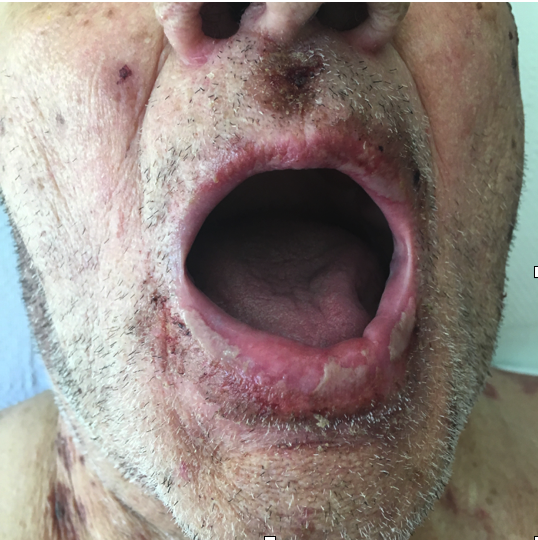 Patients with extensive mucosal involvement may have airway edema and compromise, and the emergency physician should have a low threshold for intubation in these cases. Invasive ventilation may also be necessary for patients with extensive bronchopulmonary disease. Plan for generous fluid resuscitation (similar to burn treatment) targeting urine output of 0.5-1 mL/kg/h. With respect to the rash, the blisters tend to rupture so be careful to monitor for signs of secondary infection, which is the primary driver of the extensive mortality. For wound care, avoid debridement of blisters, as the blistered skin actually favors re-epithelialization. Use non-adhesive dressings and avoid sulfa creams. Although it’s efficacy is controversial, most groups recommend a short course of pulse dose systemic steroids, best if given early in disease course. In refractory or very severe cases, IVIG can be considered as some case reports tout its efficacy. Ophthalmology should be consulted to evaluate for ocular involvement. In the acute phase, the disease often causes conjunctivitis and discharge or eyelid edema and crusting. However, more severe cases can lead to corneal erosions, pseudomembrane formation or even symblepharon (adherence of the eyelid to the conjunctiva). Ophthalmology will likely recommend some sort of lubricating eye drop and may continue to follow the patient as there can be late, serious complications including vision loss. A thorough skin exam should be performed on all ED patients presenting with a concerning rash including the oropharyngeal, ocular, rectal and genital mucosa. GI or respiratory symptoms should clue you in to potential involvement of these surfaces. TEN and SJS are a spectrum of the same disease. Buzzwords: Type 4 hypersensivity reaction. Immune complex mediated. Total body surface area (TBSA) can be estimated by the rule of 9s or by using the patients own palm to represent 1% involvement. Remember to only include blistering areas, necrotic lesions, or those that are Nikolsky positive. Simple erythema should not be included. SJS and TEN are true dermatologic emergencies with mortality approaching 30% for TEN. Mortality in SJS is 10%, EM Major is <5%. The major factor driving mortality is secondary infection. Treatment should include removal of the inciting agent and supportive care with fluid resuscitation (goal ~ 0.5-1 mL/kg/h of UOP) and wound care (non-adhesive dressings). Patients should be considered for transfer to specialized burn unit. Dermatology and ophthalmology should be consulted. Erythema multiforme minor (EMMI) refers to a hypersensitivity reaction often related to underlying infections like HSV or EBV and less so to medications like sulfonamides. EMMI usually has no or limited systemic symptoms, the rash often evolves to a target pattern, and mucus membranes are not involved. Erythema multiforme major (EMMA) and SJS are the same entity distinguished only by severity of involvement of mucous membranes and skin. Although target lesions are classic, lesions may present in multiple forms (hence referred to as multiforme) including urticarial, papular, and even vesicular. SJS and TEN are also considered a continuum of illness with labeling determined by percent of skin BSA that has blistered and sloughed: SJS < 10%, TEN > 30%, Overlap SJS/TEN10-30%. In these entities the skin involvement is more aggressive and confluent than EMMI such that targeting is often not evident. If you are not sure what to call it, extensive mucus membrane involvement favors SJS over TEN. The etiology of SJS/TEN is more often drug related than EMMI. Sulfonamides lead the list, followed by beta-lactams, anticonvulsants and allopurinol. Some confusion may arise in patients presenting with DRESS which is typically precipitated by anticonvulsants and allopurinol. DRESS will present with generalized erythroderma, sunburn-like desquamation, minor mucus membrane inflammation, facial swelling and fever. LFT elevation almost always occurs in DRESS but can be seen in SJS/TEN in up to 30%. Staph Scalded Skin Syndrome (SSSS) may have skin involvement similar to TEN albeit more superficial. SSSS lacks mucus membrane lesions and is seen almost exclusively in newborns, but may occur in adults with chronic renal failure (due to toxin accumulation). Treatment in the ED focuses on aggressive fluid resuscitation and wound care. If clearly SJS, with minimal mucosal involvement and no desquamation, consider intravenous steroid in consultation with dermatology. If presented with overlap syndrome or TEN, management is analogous to burn care. In contrast to thermal burns, the denuded skin in TEN should not be debrided (allowing peeled skin to act as biologic dressing) and Silvadene should be avoided (as sulfa drugs often can provoke TEN). Wounds should be sterilely dressed with non-adherent materials so as to avoid infection and hypothermia. Garber, B & Cydulka, K. Dermatologic Presentations. In: Marx, John A et al. Rosen's Emergency Medicine - Concepts and Clinical Practice. 8th ed. Philadelphia, PA: Elsevier/Saunders, 2014. Chapter 120, 1558-1585. Endorf FW, Cancio LC, Gibran NS. Toxic epidermal necrolysis clinical guidelines. J Burn Care Res. 2008 Sep-Oct. 29(5):706-12.